The ultimate lightweight travelling Yurt with an all-in-one frame constructed from Bamboo. The ingenious Pop-Up Yurt frame works best with smaller sized Yurts and is a great option for hassle-free Yurt camping. The Hearthworks Pop-Up Yurt is a truly unique and ingenious all-in-one frame design that enables a full size Yurt to be set up in a matter of minutes rather than hours. Ideal weekend Yurts for family camping, guest bedrooms, outdoor events, or for anyone who wants to save time and add the next level of convenience to Yurt living. The Pop Up Yurt is the brainchild of the Dorset based inventor and Yurt maker Mike Jessop, who still makes our Pop Up frames. Easily and quickly erected this UK patented design really is the ultimate camping Yurt. Lightweight enough to fit in the back of an estate car, the frames are made of finest quality bamboo, with a steamed ash ring. Solid wood framed Pop Up Yurts can be made to order, however the Bamboo Pop Up Yurt gives the design its peak performance in terms of portability and usability. Bamboo is an incredibly strong, flexible and sustainable material. Pop-Up Yurt covers are manufactured to the usual high specifications you can expect from a Hearthworks Yurt. We currently use 12 oz yd2 Regentex Polycotton from British Millerain, which is proofed against Fire, Water and Rot, to British Standards. Coloured trim is available at no extra cost and we can offer choice from tasteful pallet of colours. 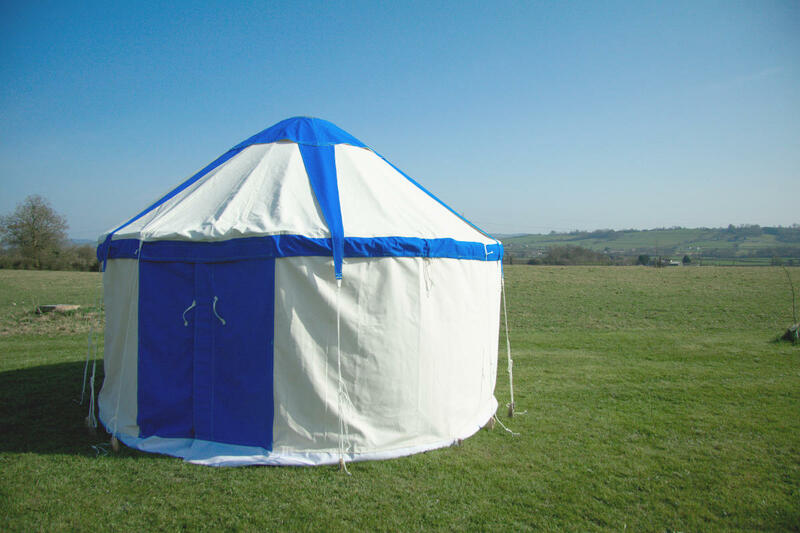 The Pop Up Yurt comes in a range of sizes, all full standing height, from 9' to 14' diameter. The most popular is the 12' Small Yurt size, suitable for sleeping 2-4 adults. As well as the skylight window you can choose to have extra Windows in the side wall that come complete with roll-down canvas curtains. You can even fit a wood-burning Stove to keep you Yurt cosy. If you want a full size quality Yurt that is portable, lightweight, and quick to install, then the Hearthworks Pop Up Yurt is what you have been waiting for. Bamboo trellis & roof poles tied with Polyester cord & PolyHemp Rope. Steam-bent Ash Roof-wheel with PolyHemp Rope & Steel Carabiners. Polycotton Canvas and Polyester Webbing Tension Band. Double thickness canvas door with velcro and cord ties. Wall Canvas with PVC bottom section and storm loops for pegs. Polycotton Roof Canvas with valance under which walls attach. Heavy Duty PVC groundsheet with upstand. Star-shaped Canvas Roof Wheel cover with Polyester ties & Ash tent pegs. We have a range of extra options to suit your requirements including wood burning stoves and windows in the side wall. All our Yurts come with one entrance way and a canvas door as standard. For additional cost, you can change to wider width doorways (for example, to accommodate wheelchair access).